An Even-Flow or Rise and Fall conveyor/hopper system creates a holding reservoir of around 700 kg of crop discharged from the box tipper. The minimum of drop is created with a conveyor which automatically lowers as crop is tipped into it. As the crop leaves the conveyor it rises to maintain the same minimum of drop for the crop from the box. Crop sensors control the 'rise and fall' and the stop/start of the belt so a continuous even feed of crop is made to the next part of the handling system. The Easy-Flow conveyor is normally 1800 mm x 1800 with a variable speed motor but these dimensions can change with different models. The Easy-Flow box tipper gives the user a high capacity machine in a compact space. The Rise and Fall conveyor forms a large enough reservoir to keep the system operating whilst the empty box is replaced. 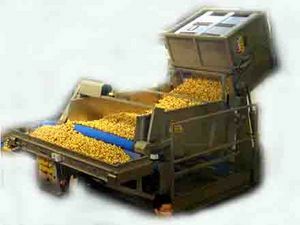 Up to 25 tons per hour can be achieved when bulk loading lorries. The main factor being the nearness of boxes and the speed of the forklifts.